On June 20, 1789, a group of peasants, serfs and wage-laborers, representatives of France’s lower-class Third Estate, found themselves locked out of a meeting in Versailles which King Louis XVI ostensibly called to formulate strategies which could pull the nation out of a state-induced financial crisis. Outraged, the oft-ignored Third Estate reps decided to call a meeting of their own, which they held on a tennis court, and at which they signed an oath against the heads of state which eventually led to the French Revolution. Historians now cite the Tennis Court Oath, originally an act of desperation from an outraged people, as one of the most important events in European history, and we continue to feel its reverberations today. On Wednesday, a different revolution from a different outraged person occurred roughly fourteen kilometers from Versailles on another tennis court. Its effects, while far less deleterious to the French government, could have a similarly wide-reaching impact on the status quo, particularly the oft-ignored, #1-ranked player and the reigning king against whom he staged his coup. It is very difficult to feel sympathy for Rafael Nadal, even if he had a really terrible birthday at Roland Garros. In a piece posted on this site in January, I wrote that, “I am not Lleyton Hewitt because I will never know what it’s like to play tennis on speedboats in the Sydney Harbor with Roger Federer,” which, in case you were wondering, is still true. Rafa is the kind of guy who could, if he wanted, play tennis on speedboats with Roger Federer. He’s a successful and handsome Spaniard who, by all accounts, is generally affable off the court. Nadal is not the best player ever – that would be Federer – or even of his generation – again, Federer – but he may be the single best foil of all-time, the perfect yang to Fed’s ying for the last decade in a truly inspiring era of men’s tennis. Much of Nadal’s counterweight comes from his dominance on clay courts, particularly at the French Open. Since his debut there in 2005, he has lost a total of two (2, dos, deux, the peace sign) matches, and prior to Wednesday, the last came in 2009 at the hands of Robin Söderling, who has not played a competitive match since 2011 and is now the chairman of the Stockholm Open. How quaint. All of that makes what happened in the quarterfinal that much more incredible. Though Söderling’s victory was undoubtedly much more surprising, this is still Rafa Nadal, a newly-minted 29-year-old who has as much ownership over the clay at Roland Garros as Louis XVI had over his serfs. His reactions were always impeccably timed, and he could be counted on to recover just when it seemed that his opposition held him at the edge, defenseless and weakened. Even if we expected this at some point, we never really expect Rafael Nadal to lose at the French Open. Novak Djokovic’s 7-5, 6-3, 6-1 straight-sets victory over Nadal was so comprehensive and outstanding that it doesn’t merely suggest a disruption of the status quo. Nadal has lost fewer sets in his career at Roland Garros than Robert Horry has NBA championships. 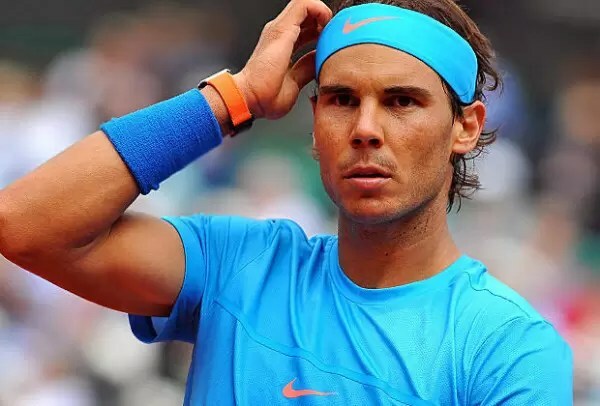 Nadal wasn’t just the King of Clay; he was an omnipotent, omniscient cyborg, programmed in the year 2273 and sent back in time to eviscerate tennis pros on clay courts. Djokovic, meanwhile, is just the highest-ranked tennis player in the world and not a nine-times-out-of-ten champion who, after all, lost in the final just last year to Rafa. Who is he to defeat Nadal? In truth, as Brian Phillips noted in a brilliant piece for Grantland last month, Nadal approached this tournament in a state of vulnerability for maybe the first time ever. Coming off losses on clay to Djokovic, Andy Murray and Stan Wawrinka, all of whom remain in the French Open for now, Rafa cruised through the first four rounds, dropping only a single set. Djokovic, meanwhile, needs only to win the French Open to complete the Career Grand Slam, and the way he has played this year almost suggests an inner rage to prove himself, despite his ranking and despite the eight Slam titles to his name. Throughout the match, Djokovic, who is only eleven months younger than Nadal, looked ageless, and what he did looked effortless. His forehands flourished, and Nadal looked confused, himself undoubtedly feeling like so many of his opponents at Roland Garros over the years. He could only watch as his Ancien Régime crumbled before him, a final objection to the oppression he inflicted upon nearly everyone for a decade. His reign has been Hapsburg-esque, and to see it deleted so quickly, like a folder of Los del Rio’s greatest hits from your desktop, was unconscionable.